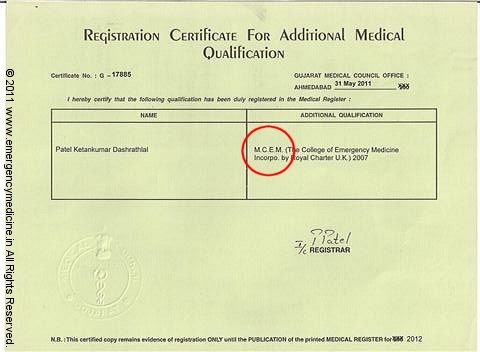 In a landmark event, the Medical Council of India (MCI) has officially registered the MCEM qualification (Member of College of Emergency Medicine) given by the College of Emergency Medicine, United Kingdom, as a additional postgraduate qualification under the specialty of emergency medicine. Dr. Ketan Patel, Head of Department of Emergency Medicine at Apollo Hospitals Ahmedabad, who had applied for the recognition, was overjoyed on receiving the registration certificate, a copy of which he sent to us at EmergencyMedicine.in, today evening. He said that This event is not just recognition of MCEM, but is the recognition of emergency medicine in India. This is a great step forward for emergency medicine as a specialty. Dr. Ketan had passed the MCEM exams in 2007. With this confirmation, the capability of Indian private institutes to create and contribute qualified emergency medicine professionals has increased phenomenally. These doctors can now work in Government hospitals and take the much needed expertise into the public & rural health sector. Emergency patients in India will be taken care by credentialed EM physicians, much earlier than expected. Apollo Hospitals Hyderabad becomes the first overseas examination center of the College of Emergency Medicine, UK, for the conduct of the MCEM examinations. 3 year residency training in emergency medicine commences. First Indian sitting of the MCEM Part B and Part C examinations conducted at Hyderabad. 3 physicians pass the MCEM. Notification passed by Ministry of Health and Family Welfare to recognize all postgraduate qualifications awarded by Australia, Canada, New Zealand, United Kingdom and United States of America. EM residency training commences at Apollo Hospitals at Chennai, Bangalore, Ahmedabad and New Delhi. Read - The Specialty of Emergency Medicine Officially Recognised in India! Other hospitals begin structuring their EM residency to satisfy requirements towards the MCEM examination.